UPDATE 2013-02-17: A commenter this week said, “I have been informed that the Wisconsin PSC has denied the Highland Wind Farm. Thanks to all who have commented and supported the town of Forest in this matter!” More on this story (and many comments by people who still don’t get that IWTs are not green) in the Milwaukee Wisconsin Journal Sentinel business blog by Thomas Content, “Wind farm proposal rejected, developer plans another try” on 2/24/13. The town of Forest in St. Croix County,WI is facing a problem. It was successful in its 2-year fight to avoid a development of 41 turbines of 2.5 MWs that are almost 500 feet high. The effort involved electing a responsive town government and rescinding permits granted without proper oversight. Now local control has been overruled by the developer’s strategy to raise the size of the project, putting it under the control of the Wisconsin Public Service Commission (PSC), which has the power to grant permitting on projects over 100 MW. If the people of Forest write a public comment on the docket, we cannot testify in person at the public hearing. When our group requested intervenor compensation from the PSC to hire expert witnesses, we were awarded a paltry sum of $20,000.00 for attorney fees only–nothing for expert witnesses. Another intervenor, CLEAN Wisconsin, a pro-wind lobbyist organization received $43,000.00 to hire a so-called sound expert, which, of course, is supporting the wind developer. At every turn, we believe our voices of opposition are being suppressed, including from the very agency that should be protecting us. The Highland Wind Farm is a project with 41 towers of 497 foot tall 2.5 MW turbines to be operated by Emerging Energies aka EEW Services, Hubertus, WI. Wisconsin Public Service Commission rules that Highland wind project doesn’t require EIS by Jeff Holmquist, New Richmond News, August 3, 2012. While the five-page document outlines several potential impacts that the wind farm project could have on landowners and the surrounding landscape, its conclusion is that there is “no significant impact” expected from the proposal. 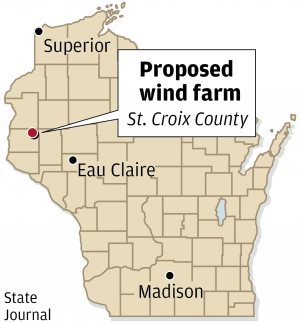 Wind farm opponents seek support from St. Croix County by Jeff Holmquist, New Richmond News, July 14, 2012. The St. Croix Health and Human Services Board will look into health concerns raised by residents of the Town of Forest related to a proposed wind farm in that community.